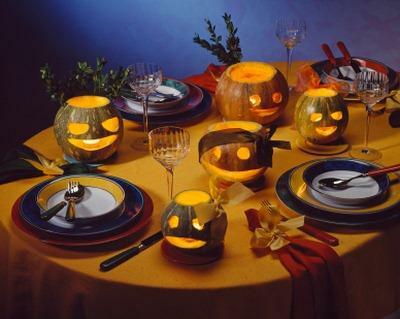 Scary Halloween party supplies can enhance the ambiance of any gathering, so be sure to put a few spooky supplies on your party planning checklist. Consider picking up items like vampire coffins, severed heads and other body parts, frightening masks, witch's cauldrons and more. To get your party started, you'll need to know what items you need and where to look for them. There are many places to find party supplies, starting with local party stores. It is also important to think outside of the normal box; think about where you've seen different items over the year. Great items for a Halloween party can be found in familiar stores, as well as many unlikely places. Party supply stores are an obvious place to start looking for scary Halloween party supplies. These stores usually stock a wide array of party items such as napkins, plates, theme items and decorations. They may also offer rentals of some larger items such as chairs, tables and tents. Oriental Trading Company: Find great decorations that don't cost a fortune for your next celebration. From scary costumes to candy, crafts and decorations, this is a one-stop online store. Fright Catalog: If you're looking for scary decorations and props, this is the place to find everything you need for a spooky Halloween celebration. Find unique items such as blood-spitting mannequins, graveyard kits, gallows and torture devices. Haunt Your Home: This store sells exactly what it says - scary Halloween props and decorations to make your home look haunted. Halloween Town Store: This Halloween retailer offers lots of decorations and party supplies including antique-looking plates, dishes, scary decorations and spooky invitations. Shindigz: Visit one of the largest party supply stores on the Internet to find party apparel, scary Halloween theme kits to transform your home, banners, creepy favors and eerie decorations. Buy Costumes: This store has more than costumes - it also sells a plethora of scary props and decorations. Find crime scene tape, full-sized mummies, flashing eyeballs and many more truly creepy items on this website. Mostly Dead: A store for the serious Halloween party decorator. Scary supplies range from creature teeth, Halloween music, and creepy changing pictures to facades and large props. Alarming Products: Find truly eerie and creepy party supplies for your Halloween bash. This merchant sells disturbing party supplies, including severed limbs, a bowl of fingers, bats, fog machines, bloody tablecloths and lots more. Spirit Halloween: Buy a wide assortment of inflatable décor items, pumpkin piñatas, bags of bones, scary door frames, rusted caldrons and a variety of bugs and rodents. Start looking for your scary Halloween party supplies as soon as possible, so you'll get the best deals. Many online merchants offer free shipping and Halloween giveaways to those who shop early.